Hello friends of ODBD! Welcome to the August release blog hop! If you got here from Sabrina's awesome blog, you are in the right place! If not, you might want to start at the ODBD Blog where you will see the entire list with links just in case any are broken along the way! The Hop will run 8am EDT Aug 1 til 8pm EDT Aug 2. The winners will be announced on the ODBD Blog on Aug 3. There will be FIVE great prizes! Five blessed people will win $20.00 gift certificates for ODBD STAMPS! These certificates will be good for 6 months!!! I made a shadow box wall hanging, using Sew Special (stamped twice and popped up), and the Pincushion Tag Set for my sentiment. I used Memento Ink and colored with Copics and Prisma Pencils. The base paper is Papertrey, and I matted with SU! Old Olive. Everything is sponged with T Holtz Antique Linen. The background for my image is a chenille scrap from a discontinued interior decorator's book that I thought looked like quilted squares. It adds lots of texture to the wall hanging. You look at everything differently when you paper craft... because so many different things can be used in your art! I got mine from my dear friend at Terryfic Times (my lss), but if you visit furniture stores and ask, they often have discontinued fabric as well as wall paper, both of which work wonderfully with paper crafts! I pierced my borders with an Ornare Piercing template and piercer. I tried to replicate some of the quilt patterns I have used in the past when quilting for the border. The little additions to the box include many little family treasures like the tatted lace, an old English thimble, and an old pack of needles. In my sewing basket I found the label from an old tatting spool, and I layered it with several layers of card stock, punched holes, heat embossed several times with UTEE and made a faux button with it. From here... you will hop to the talented and sweet BECCA to be amazed! This is fabulous! I love all the additional sewing items, along with the crochet and tatted elements. what an awesome and smashing creation! you did a GREAT job, hon! What a gorgeous shadow box Grace!! I just love the fabric squares with all the texture, your sewing details and your stunning coloring!! What an awesome and creative gift idea!! I wish I had your creative mind!! WOW!!! I would have never guessed it was a fake button! Time to get my melting pot out and dust it off. Beautiful framed shadow box, wonderful color! Love all the added sewing embellies! Very well done; nice touch with the quilt squares bordering the main design. I would love to have this hanging in my house. You did an excellent job on it. I really like the fabric squares as the background. totally awesome, Grace!!! love every little detail! Fantastic Grace!!! The details are awesome. The rug looks so fuzzy, how perfect. wow, i love the shadowbox. as i kept looking at it i saw more and more things to admire. the closeup really shows the texture in the background paper/material, and all of the little embelishments along the corners are great, just llike it use to be when you sewed. just a great piece. thanks for sharing with us. Lovely! But I have to be truthful. I really don't like music on websites, so at the first sound of a note, I turn off the volume on my computer. I just find it annoying. oh golly grace... your shadow box is absolutely amazing! love the fabric background. and i agree with sabrina... you have the most amazing ideas!! Creative and lovely. So many precious details in the lace, thread, thimble and buttons!! !Piercing is fabulous and the chair over that chenille, over that DP - perfection. Never disappointed when I visit your blog - Thanks for sharing. This is the most beautiful picture shadowbox I have ever seen. Wonderful job, I love it! This is really wonderful! It just reminds you of home. The shadowbox is wonderful and all the little extras add so much! Thanks for sharing! i love the little vignette in the bottom left hand corner. "sew" special. Love your wall hanging. I like how you used the scrap from an interior decorator's book. Great idea. Oh Grace! What an amzaing keepsake you have created here! I so love all the amazing details!! WOW!! Grace,I just love this project. The background paper looks just like a quilt. The objects added are just perfect.Love it all!! I knew before I clicked on the link to your page that I'd best sit down. . .and I thankful I did! This about knocked me off my chair as it was! Beautiful work! Love that swatch of chenille along with everything else. Gorgeous shadow box in every little detail! Blessings! WOW! What a gorgeous shadow box! So much detail. Love the fabric background, the piercing, and the embellishments in the corner are great! And, a perfect sentiment. Thank you for sharing. I just love, love, love this shadow box and may have to copy it. Thank you so much for sharing it and the chance to win. This is beyond special! I just love how creative it is, down to that chennille background! Totally Awesome! I love your shadowbox and all the little details. Thanks so much for the chance to win. This is just stunning Grace!! 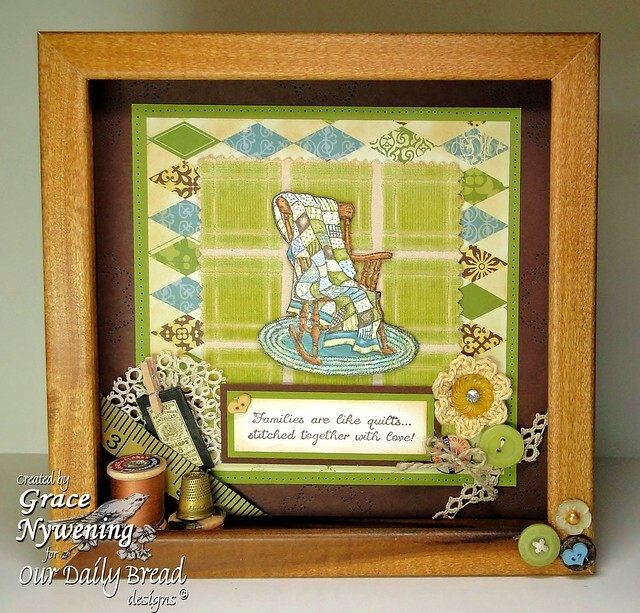 I just love this rocking chair and this shadow box is so awesome with these squares. 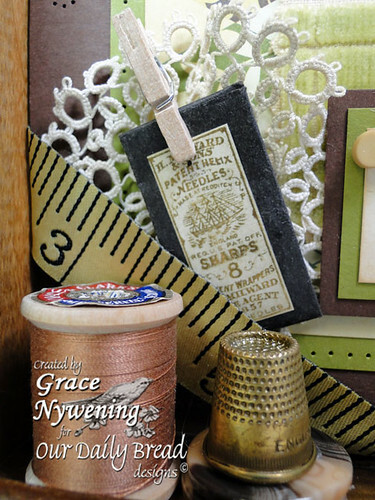 I sure do hope I win :) because you know I will be ordering from this new release :)..
Oh Grace, you simply "rocked" this Blog Hop with your exquisite shadow box. What a wonderful creation. What an adorable, notalgic addition this would be to someone's sewing room! This is just fabulous, Grace! I love your framed beauty! The little additions of wooden spool, needles and lace are wonderful and perfect. I love this shadow box. Great way to create your own art to decorate ones home. Thanks for sharing & the idea. Oh, my goodness, the details on this just blows my mind! Everything is just wonderful. love it very sweet makes me want to curl up with a nice warm blanket. Love this so very much. The mix of fabric and paper--a true work of art. What a beautiful shadow box frame with all the little details. Thanks for sharing. I love the shadowbox idea....and the colors are wonderful. Thanks for sharing. Absolutely Stunning! Love all the detail!!! Very nicely done! I like all the old extras you added. This is a wonderful project, Grace, so much detail. The sentiment and all the texture you used add so much. Fab wall hanging. The background is perfect. Love how you added the embellishments. what a GORGEOUS GORGEOUS WALL HANGING!!! love all the little details you added and the fabric squares and cool too!! Your shadow box is beautiful! I love the colors and all the wonderful elements. I am loving these stamps! Oooooh! This is so clever; so many wonderful details! Love the tip about getting scraps of fabric and wallpaper! Thanks as always for sharing your talent and creativity!!! What a beautiful shadowbox!! Love the texture of your background and all your vintage elements. Beautiful work, Grace! Love the colors! This is a stunning shadow box. Wow - love the shadow box!! It's beautiful!! Love the shadow box wall hanging. The colors are great and love the embellishments. Really nice! I love the added 3D embellies! So cute! I sure do love this rocking chair and quilt. I love the application too. Thank you! Sensational idea -- love the music background as a very special treat!! Thanks for this lovely touch. And, now to figure out how to find decorator samples!!! Had not thought of this as a "supply source!!" Oh, goodness, that's gorgeous! I just went to a warehouse frame sale with 3 friends this weekend where we could stuff a box for $20. I chose a couple deep ones, now I wish I had more. Thanks for some great inspiration. What a stunning shadowbox Grace. The sentiment is so perfect for this framed masterpiece. Oh My! This is just georgeous. Love it. Grace just love your sentiment and how true it is. your work is exceptional. Fabulous shadowbox!!! 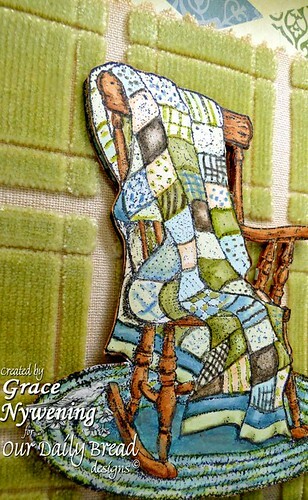 I love all the layers and textures you used and the way you colored the stamped image of the quilt/rug/rocking chair. I'm totally inspired to make my own shadowbox now, thanks to your creativity! Oh my word Grace, this is magnificent!! What a stunningly beautiful keepsake you've created, my friend! Your sweet talent knows NO bounds!! Grace this is absolutely beautiful!! Where do you come up with such wonderful ideas!!! I want some!! I love everything about your project!! I loved all the colors and the chenelle background. I am just stunned by your LO Grace, being new to scrapebooking, I have no word to use other than fabulous. God bless. wow!!! this is really gorgeous! A art piece! Wow I love your framed box. Love the colors and buttons your used. I like how you add real sewing items. I loved your shadow box. All the embellies were just the right touch. Great shadowbox... so dimensional and heart warming! Christmas Carols are my warm fuzzy! oh, this is such a wonderful "picture" and would look so lovely in my sewing/craft room. i almost never leave a comment on your blog but your cards/creations are always fabulous. and i always appreciate your devotionals. thanx. Wonderful shadowbox! What a great way to display those special little family treasures! What a beautiful work of art. So many details, you can look at it again and again and find something new. The quilt and the background are perfect! Goodness, your shadowbox is a work of art!!! I love that you mix fabric and paper together. I am a quilter, sewer and paper crafter. I find it so interesting how these passions work so well together. Thats for the amazing inspiration today! Oh for goodness sake! This is amazing! Did it take you weeks to make? Grace - you never cease to amaze me! Beautiful! Grace this is amazing! I am loving that chenille background and your sewing notions!!! LOVE this! Wow, such a neat project. Love all the embellishments! What a great idea for using a shadow box frame. So much detail and so much work, it's just so lovely. Your creativity is beautiful. It makes me want every stamp. Their all so beautiful. What a great idea to make a shadow box! You always have such lovely ideas! TFS! Such a wonderful project!! Love the colors! Grace, I love everything about this project. It looks awesome! Simply stunning Shadow box, I love your quilt card,beautiful. Grace, this is an absolutely stunning shadow box project! Another excellent gift idea for me to make for a dear friend! Thanks again for sharing your wonderful talents with so many! Very pretty card. Love the colors and the quilt and rocking chair are great symbols of our past with great memories. I considered writing you an email, because I am so late in commenting Grace. Your card is especially an example of love and family to me. Oh my how you have captured the beauty of "home!" Thank you for sharing your special way of showing such a great feeling! This is absolutely beautiful!! What a treasure. Your coloring is superb and all the details you included in the box work together perfectly! I love your picture! 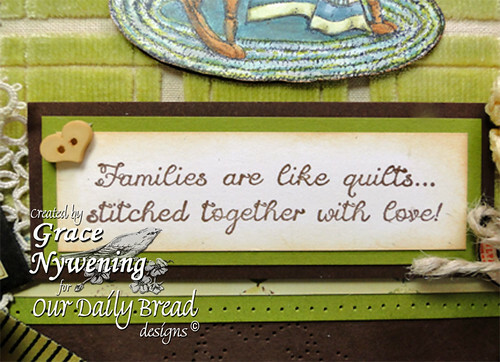 The new ODBD sewing stamp & die set works great with the other elements you chose. That thimble is turning my head! Such a lovely shadow box. Wow, great project! I love the colors, and all the special embellishments, especially how you made that button. The background swatch is genious and fits perfectly...love the crochet and tatting, and the addition of the old items. Fabulous shadow box! Wow! Pretty colors, love the theme, the embellishments and your use of the chenille scrap, very creative and pretty!! You are very creative, what a lot of good ideas! Thanks! May God Bless you! Grace, I am always blown away by your creativity and artistic ability. This is truly an amazing project. Beautiful card Grace, I love these new sets. Wonderful shadow box. I love your site, Grace. Your cards and inspiration are always top notch. What a very creative way to showcase these new terrific stamps. Your shadow box is truly a work of art! Oh my goodness, how beautiful is this framed art, and I just love this new stamp set! Gorgeous! Totally love the card and the colors are just beautiful. Also love the picture of your cat. I am a cat fan. Thanks for sharing. Oh Grace this is so special! Just love all the items you put together to make this! Really love these new items!!!! This is a beautiful shadow box. Thank you for sharing! What a gorgeous shadow box. Love the colors. Grace, this is just amazing. Wonderful use of these new sets and all the fabulous details you added make this so special. wow this just pops out at me. I love the colors and the embelishments. I might have to use this in my scrapbooking one day. I love these stamps. I'm not a quilter, but my sister is. This is a very nice stamp set. Grace, this is AMAZING! LOVE LOVE LOVE the chenille you've added and the entire project is sure to become a family keepsake! Fantastic work. You are so right about using so many things in papercrafting. It really lets mixed media take over, and you think about including things you never dreamed of using before. You did a great job! What a beautiful work of art! Nice detail. Thanks for shariing. Totally love it! The more I see this stamp, the more I want to have it... to the max! Grace, I LOVE this shadow box. As someone that likes to sew and one that loves family it is a perfect gift for anyone that loves either or both!!!! WOW! What a wonderful work of art - all of that detail is awesome!